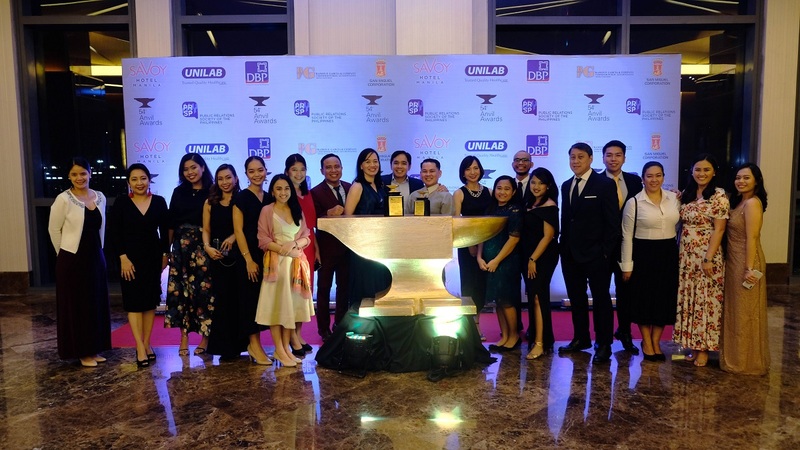 BPI received two Silver Anvil trophies at the 54th Anvil Awards. From left: Stella Aro, Institutional Brand Management and Digital (IBMD); Arlene Mendoza, Overseas Filipino (OF) Segment; Edelyn Sagales, OF Segment; Kathy Hofileña, Sustainability Office; Krystle Gomez, Sustainability Office; Janelle Monsanto, Sustainability Office; Ritche Fariñas, OF Segment head; Maricris San Diego, BPI Foundation executive director; Owen Cammayo, Corporate Affairs and Communications (CAC) head; D’artagnan Aguilar, IBMD head; Athena Balleza, OF Segment; Majo Lopez, IBMD; Louie Gaela, IBMD; Don Sevilla, Compliance; CJ Arribay, OF Segment; Ana Jose, OF Segment; Rachelle Dangin, CAC; and Kristabel Penafuerte, CAC. The Overseas Filipino Financial Wellness Program (OFFWP) of the Bank of Philippine Islands (BPI) bagged an award from the recently held Anvil Award for engaging overseas Filipino workers in various initiatives to communicate the importance of financial planning and educate them on saving and investing for retirement. Ritche Fariñas, head of the BPI Overseas Filipino Segment, said the award was given by the Public Relations Society of the Philippines (PRSP) and is an affirmation of the commitment of the BPI to provide value to overseas Filipino customers.“It serves as an inspiration for us to strive even better in creating relevant programs for them,” he said. Meanwhile, BPI corporate affairs and communications head Owen Cammayo said the Anvil award they receive validates that they are on the right track in their efforts to support the Overseas Filipino Workers (OFWs). “The recognition validates that we are on the right track in our efforts to reach out to and communicate with our many overseas Filipinos who work hard to provide a better life for their families. Effective communications is critical to enable our modern day heroes to become more financially stable and secure,” said Cammayo. Under the OFFWP, BPI created several financial modules that include financial literacy talks on the importance of saving and investing, including tips on managing remittances from their loved ones abroad. BPI also launched new products and services, such as the Pamana Padala and Padala Moneyger, that cater to the needs of both overseas Filipinos and their beneficiaries. The BPI also received another Anvil award for its 2017 Annual Report in recognition of its comprehensive narrative, highlighting how it cultivates long-lasting relationships with clients, and how its Sustainability Strategy Framework (SSF) resulted in positive financial benefits. With the central theme “Enriching Relationships”, BPI’s 2017 Annual Report shifted from being purely a financial report to one that integrated Bank’s sustainability report. Through a succinct and clear writing style complemented with vibrant design, BPI’s integrated report focused not only on the Bank’s financial achievements but also on why and how BPI remains an important and empowering presence in the lives of Filipinos.